Wow, I got I LOVE YOUR BLOG award! 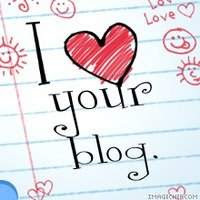 1) Link to at least 7 other blogs you love. 2) Link to the person who gave you the award. 3) And let the 7 bloggers know that you have tagged them. Thanks for the award. It means a lot. Appreciate it. I am honoured to know you give me this award, Dear friend. Your blog is dainty! I like it! I didn't know much about Oprah. Thank you for sharing this article, it's very informative. About the her quote, I think people have no contentment. If they have million dollars they want billions.